Iron ore miner Rio Tinto said Friday that increased use of its $940 million AutoHaul automatic mine transport system has allowed the company to establish the world's largest robot and first-automated heavy-haul, long distance rail network. Since completing the first loaded run in July, Rio Tinto has steadily increased its number of autonomous train journeys, transporting iron ore to its port facilities in the Pilbara region of Western Australia, with over 1 million km (620,000 miles) now safely travelled autonomously, the company said in a statement. 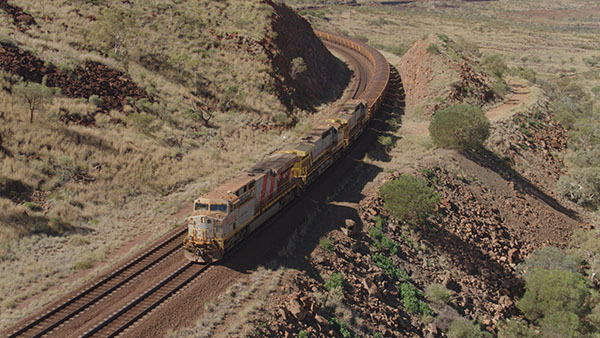 Rio Tinto operates about 200 locomotives on more than 1,700 km of track in the Pilbara, transporting ore from 16 mines to four port terminals. The average return distance of these trains is about 800 km with the average journey cycle, including loading and dumping, taking about 40 hours. Locomotives carrying AutoHaul software are fitted with on-board cameras allowing for constant monitoring from the company's Operations Centre. All public rail crossings on the network are fitted with CCTV cameras, it said. Rio Tinto Iron Ore managing director Rail, Port & Core Services Ivan Vella was cited as saying that it has been "a challenging journey to automate a rail network of this size and scale in a remote location like the Pilbara, but early results indicate significant potential to improve productivity, providing increased system flexibility and reducing bottlenecks." Wood Mackenzie principal analyst, steel and iron ore markets, Alex Griffiths said earlier this month that both Rio Tinto and BHP will face an increasing need to reduce iron ore production costs via use of conveyors and driverless trucks to help lower-grade Australian iron ore compete more effectively with high-grade Brazilian iron ore.
Rio Tinto said that over the coming months it plans to continue to refine its autonomous operations to maximize value. "We continue to work closely with drivers during this period and do not expect to make any redundancies in 2019 as a result of the deployment of AutoHaul," it said.